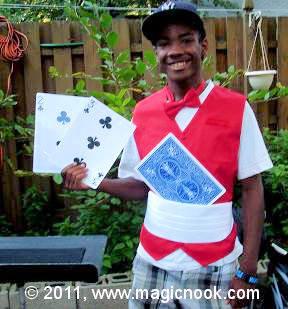 to produce a magic show for kids of all ages! 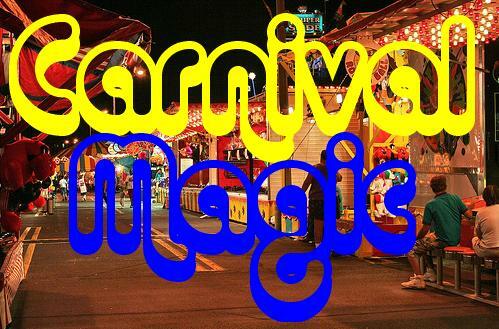 Use these plans to construct a combination magic table/carnival booth for presenting this series of Carnival Magic Show Tricks! 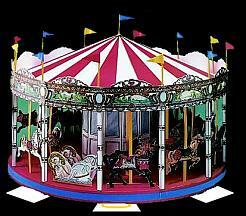 Several models and sizes are shown; one for living room birthday party shows, one for stage or platform shows, and one for actual use in an outdoor carnival, and a game stand. A booth , table or a game stand are required for many of the effects that follow. Most can be made from PVC pipe or wood ... your choice. Several candles are lighted in different colored votive glass holders. A player is selected to try and squirt out a candle for a prize; the more candles he squirts out, the more prizes he wins. However, the squirt guns don't seem to be cooperating. They squirt everywhere but straight ahead. One squirt gun pops out a "SPLAT!" banner like the old Bang Gun. Finally, the carnival barker (that's you!) allows the kid to use a finger gun and just name the color of the candle he wants to squirt. Now he gets perfect hits every time just by naming the color of the candle. Several colorful gift boxes are shown and the player selects one. But now he has to guess what's inside his mystery box before he opens it. If he guesses right, he wins the box; otherwise he gets a booby-prize. He is asked to choose a color, spin a wheel to pick a number, and then to point out his favorite plush animal from the prize shelf. When he opens his mystery box he finds another box inside, with a card attached. The card is the color he chose. On the back of the card is written the number he chose and inside the box is the exact plush animal he selected. Because he guessed all three items correctly, he wins the prize! How did he get to be so lucky? It must be the lucky charm you find hanging on his back! None of the three items is forced. Special Thanks to Allen Hanuska who inspired the original idea. Will the kids succeed in dumping a bucket of water on the magician's head? All they have to do is toss enough beanbags at the target and down it will come! 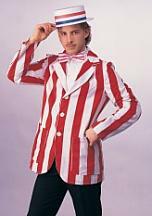 However, they are the ones who get a magic surprise instead, with this variation on the old Clown Circus Trick! Includes a wet outdoor-only version, as well as the dry version, suitable for indoors and use on any stage. Who is the strongest one of all? Kids line up and take turns pounding the Striker, trying to send the ball up the wire to hit the bell. Only the very littlest succeeds! This game is rigged! But all the kids who try get a prize for trying, so they're not complaining. And when the gong rings, the whole top changes to reveal a photo of the winner with BIG muscles, which he or she gets to keep as a souvenir. The Carnival Barker shows how easy it is to send a bowling ball on a pendulum crashing into a stack of pins to knock them all down and win Big Bucks! Then the player tries it and discovers that the pins and the ball don't exactly cooperate for him or her! Still, the player manages to win some Big Bucks in the end. This is one the kids all like! Use an oversized Golf Putter to get the oversized Golf Ball into the Potty. However, the lid comes crashing down at the oddest times, making it more difficult than you might think. The prize for finally succeeding will leave them laughing, too! Kids spin the Wheel of Fortune and try to win a nice prize. Unfortunately, they all have the worst luck and can only turn up the Booby Prize with every spin of the Wheel. 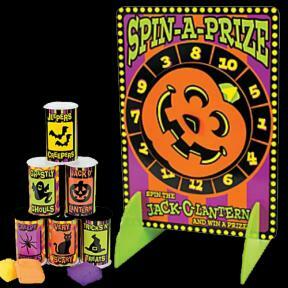 Includes directions for 12 "after party" Halloween Party Games so you can change their luck and let them win those nice prizes after all..
All items required to make this magic effect are available from: Oriental Trading using exact ordering information given in the e-Book. This doesn't have to be used just at Christmas, but will fit any theme where a Carousel or Merry-Go-Round is appropriate. Or disguise it as a Roulette Wheel or a Wheel of Fortune at a carnival. Unlike most of them, this one is rigged in favor of the spectator, who just can't seem to lose. Ace Chaser is Qua-Fiki's variation of "Chase the Ace," usually attributed to Ken Brooke but actually invented by Eddy Taytelbaum in the late 1940's under the name "Find the Ace." No matter. A lot of magicians have contributed to it since then, including Ken Brooke of England, Jim Gerrish, Joe Monti, and now Qua-Fiki is taking it to new heights. Suffice it to say that Qua-Fiki can show all three cards, faces and backs, quite openly and in his hands - seemingly "gaffless." So can you by printing out and constructing the jumbo cards following Qua-Fiki's directions. You can also include Qua-Fiki's variation of Paul Harris' "Twilight Angel" on the back of the jumbo Ace of Hearts if you wish. It's all described in the e-Book.